RANCHO SANTA MARGARITA, Calif. -- A specialty dog food company is voluntarily recalling a frozen product distributed in four states over fears of possible salmonella contamination. 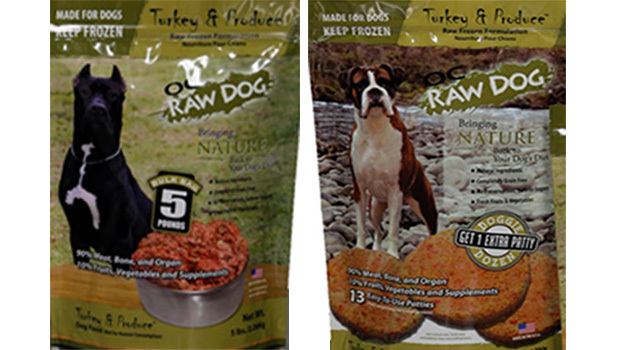 The Food & Drug Administration said last week that California-based OC Raw Dog has recalled its Turkey & Produce Raw Frozen Canine Formulation. The recalled formulations were packaged into 6 1/2-pound Doggie Dozen Patties and 5-pound Bulk Bags with sell-by dates of Oct. 8. The products were distributed in Colorado, Minnesota, Missouri and Pennsylvania. The food is sold through independent pet specialty retailers. Consumers can return packages of the recalled dog food to the retailers for a full refund. No illnesses have been reported. The FDA says pets with salmonella infections may be lethargic and have diarrhea, fever and vomiting. There have also been cases in the past of salmonella from pet food sickening humans who came in contact with it, but no human illnesses have been reported in the current recall.